It was an absolutely beautiful day when I went to Wraps and Rolls Hawaii. This was on February 10, 2010, so yes, I'm still behind on my blogging. ;) It was sunny, blue skies without a cloud to be seen, about 70 or 72 degrees (about 21-22C for you Euros) and breezy so it made the LONG walk (I'm talking a good long block from the Bank of Hawaii on Ward Avenue to Ward Centre) absolutely wonderful. Days like this make me so happy to live in Hawaii and cement the fact why tourism is our number one industry. I have lived all across the United States and have never encountered a day so "perfect" as that day. Ward Shopping Center is having a promotion until February 28th where participating merchants offer $5 Meal Deals so I thought I'd try the 2 wraps for $5. 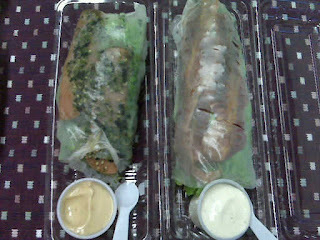 I got the Teri-Spam wrap and the California Turkey wrap. Each wrap is made with lettuce, rice noodles and fillings wrapped in rice paper (think summer roll, but sans shrimp and mint). The Teri-Spam wrap (I eat Spam and I love it, MMMM) is a few chunks of Spam with a light teriyaki sauce, cucumber and furikake, served with a sweet mayo sesame dressing. The California Turkey is deli turkey meat, bacon (YUM!! ), tomatoes, avocado (double YUM!!) and cucumber, with ranch dressing. 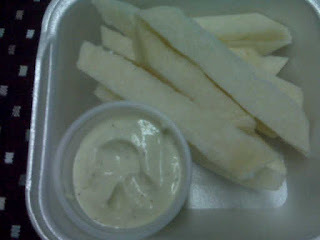 While waiting for my wraps, the menu item "Jicama Sticks - aka "UN-FRIES") intrigued me, I like jicama in California Pizza Kitchen's BBQ Chicken Chopped Salad so what the hey....I needed to taste-test the creamy wasabi dressing anyways. OMG, these wraps were delish! I could only eat one for lunch, that's how nicely filled they are. I think they could probably get away with less rice noodles for a less carbohydrate-packed wrap, but it was wow. Something so simple yet so delicious. I kind of got tired of the jicama sticks about halfway through so I would have been happy with the half portion for half the price. I went a little late, about 1:30PM, and the place was deserted. Please don't let another fabulous "secret" die away and go support them. They also have a LONG list of soda floats, shakes and smoothies which will be perfect to have once the weather warms up in the summertime.